Noradèle Radjai is a partner in the international arbitration team, specialising in commercial and investment arbitration in the energy (in particular oil and gas), telecommunications and construction sectors. She also advises clients from the Middle East or in relation to contracts or projects in the Middle East. Ms Radjai has acted as counsel, advocate and arbitrator in over 50 international arbitration proceedings, both ad hoc and institutional (under the ICC, LCIA, SCC, ICSID, AAA/ICDR, UNCITRAL and Swiss Rules), including disputes arising from share sales and acquisitions, joint ventures, and large projects, governed by a variety of procedural and substantive laws including Swiss, English, Lebanese, Kuwaiti, French, Russian, Cypriot, New York and Californian. Ms Radjai is highly recognised by the leading legal directories. She is currently ranked as one of the top 5 arbitration partners globally under the age of 45 in Who’s Who Legal: Future Leaders – Arbitration 2017 as well as in the same publication’s global ranking for all arbitration practitioners (Who’s Who Legal: Arbitration). She is also included by Chambers Global and Europe in their Europe-wide and Switzerland rankings of leading arbitration counsel. Ms Radjai is a member of the Steering Committee of the IBA Arbitration 40 Subcommittee (IBA Arb 40), immediate past co-chair of ASA below 40 (Swiss Arbitration Association) and past member of the Executive Board of ICDR Young & International. She is also a member of several other professional associations, namely the LCIA and LCIA YIAG, the Chartered Institute of Arbitrators (CIArb), the BIICL, the American Bar Association and Arbitral Women. 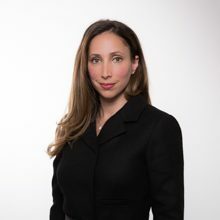 Prior to joining LALIVE, Ms Radjai worked in the international arbitration group of Skadden, Arps, Slate, Meagher & Flom LLP in London, and with Simmons & Simmons in London. Noradèle Radjai is a Solicitor-Advocate of the Senior Courts of England and Wales. She holds a Diploma in Law, with distinction, from the College of Law, London, and an LL.B., with honours, from Kings College London. “Brilliant and relentless” and a “lawyer of the highest calibre”. Noradèle Radjai stands out for her work on energy and construction sector disputes, including those relating to gas supply agreements or the termination of joint ventures. "She is an extremely good cross-examiner." Noradèle Radjai receives widespread plaudits for her exceptional work in the field of international arbitration. She focuses her world-class practice on both commercial and investment arbitration, most notably across the construction, energy and TMT sectors. Noradèle Radjai regularly acts as counsel on energy, construction and telecoms proceedings, with recent work involving supply agreements and gas pricing arbitration. One client states: "She treads the fine line between fighting for the interests of the client on one side, and courtesy towards the opposing party on the other. She is always on the ball, very solution-oriented and shows a great understanding of the business, market and commercial issues." Noradèle Radjai continues to impress clients with her “commitment, understanding, quality and focus” throughout the entire arbitration process. Lalive is ‘in a league of its own’ regarding international arbitration and the ‘strength in depth of its first-class team is outstanding’. Among its ‘many exceptionally bright lawyers’ is the ‘brilliant’ Noradèle Radjai. Noradèle Radjai is a rising star of the international arbitration field, drawing glowing praise from sources for her advocacy skills in particular. Her growing experience includes cases in sectors such as telecoms, energy and construction. Noradèle Radjai receives exceptional client feedback for her work as an arbitration counsel, with interviewees enthusing that "the amount of energy that she has is incredible. She's beyond responsive, extremely accommodating and just very clever. Truly an exceptional woman." She has excellent knowledge of energy matters. Noradèle Radjai is “first-class” for energy, telecommunications and construction disputes. Noradèle Radjai impresses sources, who applaud her cross-examination skills. "She has a very good grasp of her work and her presentation is very clear; she is a pleasure to work with," enthuse commentators. Lalive is ‘outstanding in the field of international arbitration’. Among its ‘many excellent lawyers’ (…) is the ‘strong’ Noradèle Radjai. Noradèle Radjai “continuously proves herself to be a brilliant lawyer”. The “fantastic” Noradèle Radjai specialises in commercial and investment arbitration in the energy, telecommunications and construction sectors and is lauded for her “focus” and “diligence”. Noradèle Radjai is ‘a very sharp lawyer, fighter and supreme diplomat at the same time’. Noradèle Radjai is appreciated for her cross-examining skills and analysis of cases. Noradèle Radjai is 'one of the outstanding figures of the younger generation of Swiss arbitration experts' and received high levels of recommendation from clients. Noradèle Radjai 'has a great future ahead of her', a source predicts. 'Her handling of our case has been absolutely brilliant'. Arbitration and price review negotiations: previous arguments no longer relevant? Dubai 06/05/2018 Noradèle Radjai Speaker: Damnum emergens, lucrum cessans, and moral damages – How to calculate without double-counting? London 24/01/2017 Noradèle Radjai Speaker: The Impact of Insolvency of a Contracting Party: What Can You Do Under Your Agreement? Dallas 17/06/2015 Noradèle Radjai Panellist: Is International Arbitration really flexible? For more information, see the programme, the presentation and the article published in the Agefi. Paris 05/12/2013 Noradèle Radjai Speaker: Inherent powers of arbitrators: are they the true masters of the proceedings? For more information, see the programme attached. For more information, see programme attached. For more information see the site of Young ICCA. Paris 03/07/2011 Noradèle Radjai Speaker: Arbitral Institutions intervening in proceedings: where do we draw the line? Dubai 16/03/2011 Noradèle Radjai Speaker: Does the faith or nationality of an arbitrator matter (the implications of the Jivraj decision)? For more information, see the FIAA website. Confidentiality in International Arbitration: Myth or Reality? & Disposing of the Parties’ Dispute Quickly: The Parties’ Saving Grace or Worst Nightmare? For more information, see the ASA below 40 programme.